Dust collection is a vital process for coal handling, cement fabrication, metal fabrication, mining, chemical processing, woodworking, pharmaceutical, recycling and agricultural industries, among many others. Industry-specific state OSHA regulations require companies to hold their facilities to strict standards for indoor air quality, and the EPA and other regulatory bodies put limits on emissions of dust, smoke and fumes into the atmosphere. Dust collectors play a major role in helping companies meet these requirements and improve both indoor and outdoor environments by capturing a high percentage of the particles emitted by industrial processes. Dust Collectors – Adwest Technologies, Inc.
Baghouses are the most common dust collector design and are often the most cost-effective. Baghouses draw contaminated air in through ducts to a hopper-shaped baghouse containing fabric filters made of cotton, synthetics or glass-fiber. The air is pulled through the fabric bags by a vacuum-creating fan, leaving behind dust, smoke and particles; clean air exits through the fan at the outlet, while dust particles either cling to the filter or settle into an airlock at the bottom of the hopper, which is routinely emptied. As a cake of dust accumulates on the filter, it actually increases the effectiveness of the filter for trapping tiny particles. After a point, however, the filter cake can become too thick and begins to stress the system, so occasional cleaning is necessary to ensure sufficient airflow through the filters. For this reason, baghouse dust collectors are sometimes equipped with vibrators that shake filters free of dust. Similarly, jet dust collectors are baghouses which use jets of compressed air to blow the dust-caked fabric bag filters free of excess dirt. Some dust collectors, such as cyclone dust collectors, settling chambers and baffle chambers, do not rely on filters but instead rely primarily on gravity and inertia, and thus are known as inertial separators. Cyclone dust collectors use centrifugal, or cyclonic, air movement within a hopper-shaped chamber to separate particles from the air; the particles, being heavier than air molecules, are thrown against the outer wall of the hopper and fall to the bottom, where they are collected. Multi-cyclone dust collectors have a single main inlet on one side and a single outlet on the other side, but incorporate many cyclone cylinders inside the chamber that run concurrently; single-cyclone dust collectors have only one cyclone. Settling chambers reduce the speed of an air stream, which allows the heavier particles to settle out more quickly. Baffle chambers set up a barrier that forces the air to change directions suddenly so that the inertia of the heavier particles does not allow them to remain suspended in the air stream and they fall to the bottom of the chamber. Cyclone dust collectors, settling chambers and baffle chambers are most effective at removing the coarser dust particles from contaminated air, and so are well suited as pre-cleaners for baghouses and other dust collectors that are more efficient at removing fine particulate. Large facilities usually incorporate baghouses, jet dust collectors and inertial separators into sizeable dust collecting systems, with overhead ductwork and capture arms with suction hoods that hang over the workspaces where dust is formed. 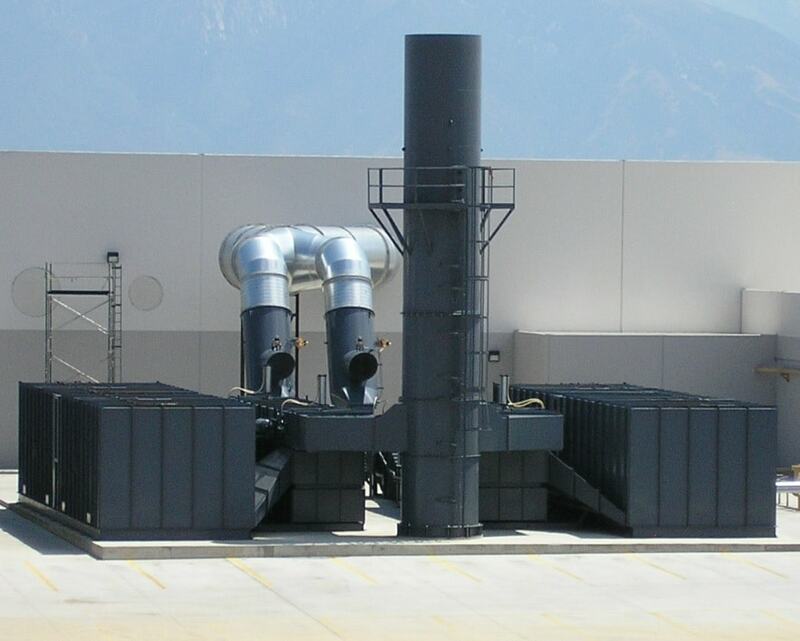 In such applications, the dust collector apparatus is often located outside of the facility, connected to the interior by ducts. Facilities may also use smaller, self-contained ‘unit’ dust collectors or portable dust collectors, either in addition to or in place of larger systems. Generally using fabric filters or cyclonic motion to collect particles, portable dust collectors can be easily moved from place to place to provide localized dust collection. Similarly, downdraft tables are work tables with built-in dust collection equipment for filtering the dust from processes performed over the table, such as welding and wood sawing. Some special downdraft tables and unit dust collectors, known as wet scrubbers or wet dust collectors, use liquids (usually water) to intercept dust particles from the stream of gas. Others, known as electrostatic precipitators, give particles a negative charge and then attract them out of the air stream by means of a positively charged electrode. Wet scrubber and electrostatic precipitator technology is also employed in some air pollution control equipment, performing similar functions on molecular levels by removing soot, smog and fine chemical pollution from the air of industrial facilities. As the dust collecting industry advances, smaller, cleaner and more efficient separating and filtering equipment is being developed to better meet the needs of industry while increasing worker safety and protecting environmental health. Dust Collector Manufacturers & Companies The particles released during manufacturing processes are hazardous to both worker and equipment health, quickly leading to a number of problems if particles are not captured by dust collection equipment and filtered from facility air. Dust collection addresses this problem by drawing contaminated air through a filter or separator, trapping harmful particles and releasing cleaner air into the atmosphere or back onto the work floor.